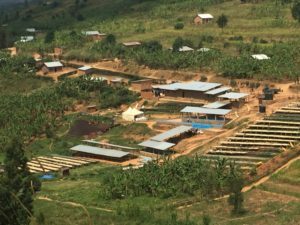 Nova Washing Station is located at 1,482m in the district of Gicumbi of Northern Rwanda and was built in 2005 as a cooperative run mini-washing station. Coffees are pulped using a 3-disk pupler machine, and then dry and wet fermented before sun drying on raised beds. Coffees processed at the Nova Washing Station grow in volcanic soil on farms nearby at 1,750m. The Nova Washing Station is female run, by Agnes Mukamushinja. Agnes and her husband Felix Hitayezu bought the site in 2013, with plans to increase the capacity of operations. Agnes is dedicated to producing the best possible coffee and using it to transform her community. 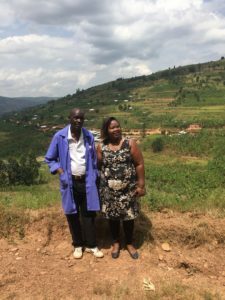 Through a partnership with Rwanda Trading Company, Nova Coffee has the ability to increase efficiency and quality and have used their profits to further invest in the operations of the wet mill and the farms in the community. Following the 2015 season, they were able to install a new pulping machine, new fermentation tanks with sorting and floating areas, new drying beds, and a high quality warehouse for storage. Rwanda Trading Company owns and manages 7 washing stations in Rwanda and works directly with many independent farmers throughout the country to help improve production, quality control and market their coffees. RTC was established in 2009 as a vehicle for social impact and offers financial literacy, agribusiness management and agronomy training programs to its partners to increase yield and keep them operational, profitable and healthy. Cupping Notes - Well balanced, clean body, winey acidity with a sweet finish and notes of fruit, figs and lemon.